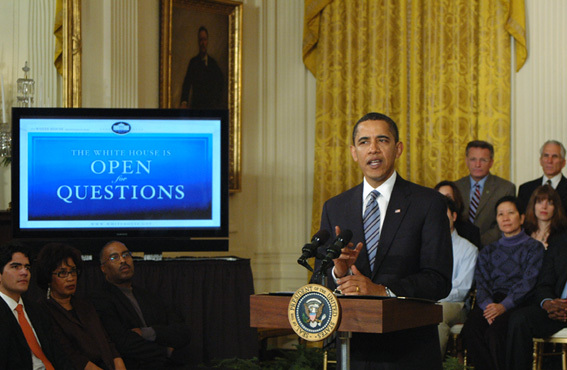 March 26, 2009--"Open for Questions," a online townhall focused on the economy, drew 104,074 questions from 92,933 people. The White House reported that Internet users cast 3,605,985 votes in selecting the most popular questions. The "first 100 days" is an arbitrary notion. The original first 100 days refers to the start of President Franklin Delano Roosevelt's tenure in 1933 during the Great Depression (+), and the 100 days continues to be used as a convenient marker to measure a president's early progress. Just as one cannot judge how a runner will perform in a marathon from the first two miles, one should not draw too many conclusions about a term of 1,461 days from the first 100 days. Nonetheless the early actions of a new adminstration are fraught with symbolism and can give a sense of how it will operate. Groups had been pressing for fast action on everything from health care reform to closing Guantánamo to the Employee Free Choice Act to DC statehood to pursuing alleged transgressions of the Bush adminstration. President Barack Obama's first official act, on January 20, was to issue a proclamation declaring the day a National Day of Renewal and Reconciliation. On January 21, his first full day in office, Obama sought to emphasize openness and transparency; he signed executive orders on presidential records and ethics commitments by Executive branch personnel and presidential memoranda on the Freedom of Information Act, a pay freeze for senior White House staff, and transparency and open government. On January 22 he signed executive orders requiring closure of the detention facilities at Guantánamo "as soon as practicable, and no later than 1 year from the date of this order" and ensuring lawful interrogations. And on January 23 he issued a memorandum rescinding the Mexico City Policy ("global gag rule"), a Reagan-era rule that set limitations on USAID grants to nongovernmental organizations involved in family planning. The beginning of any administration is a time of many firsts. On January 26 Obama did his first formal interview as President, speaking not to an American network, but with Al Arabiya. On January 27 Obama made his first trip to Capitol Hill, holding meetings with House and Senate Republicans to promote his economic stimulus plan. On January 28, with wars continuing in Afghanistan and Iraq, Obama made his first trip to the Pentagon as commander-in-chief. On January 29 he signed his first piece of legislation, the Lilly Ledbetter Fair Pay Restoration Act. On February 9 he held his first news conference as President. On February 20 he made his first trip overseas as President, visiting Ottawa, Canada for about six hours. On February 22, the Obamas hosted their first State Dinner, feting the nation's governors who were in town for their annual meeting. On February 24 he met with Japanese Prime Minister Taro Aso, his first meeting with a foreign leader at the White House. On April 20 he held his first Cabinet meeting. The work of building the administration continued throughout the 100 days, and will continue in the weeks and months ahead. Treasury Secretary-designee Timothy Geithner was confirmed on January 27, but it took longer than expected after it was revealed he had not paid some back taxes and a housekeeper he employed had not had proper documentation. There were early rumblings that Republicans might target Obama's Attorney General pick, Eric Holder, but that did not happen. HHS-designee Tom Daschle ran into problems with unreported income and back taxes and withdrew from consideration in early February; Nancy Killefer, Obama's choice for chief performance officer also withdrew. The Senate took two months to approve Rep. Hilda Solis (D-CA) as Labor Secretary after questions were raised about leins on her husband's business. Commerce proved particularly vexing. After Obama's first choice, Bill Richardson, withdrew, Obama announced Sen. Judd Gregg (R-NH) for Commerce Secretary on February 3, but less than two weeks later Gregg withdrew. Obama finally settled on former Gov. Gary Locke (D-WA), and announced his selection on February 25. On March 2 Obama named Gov. Kathleen Sebelius (D-KS) as his choice for HHS Secretary. Questions over abortion slowed Sebelius' confirmation, but the Senate finally approved her nomination on April 28. The administration continued to announce appointments to the White House staff, nominees for subcabinet positions (Deputy Secretary, Under Secretary, Assistant Secretary), agency administrator posts, and members of various boards and councils, as well as people to fill Schedule C (political) positions. "The Most Severe Financial Crisis Since the Great Depression"
On the very day Obama was sworn in, the Dow Jones Industrial Average lost 332.13 points. Layoffs and job cuts continued. The first order of business was the economic stimulus package, which stands as the signature accomplishment of the first 100 days. After early talk that they might have a bill waiting for Obama when he arrived in the Oval Office, Democrats aimed to pass stimulus legislation by mid-February. How big would it be, what would it include, and how much Republican support it could garner? On January 28 the House passed the $819 billion American Recovery and Reinvestment Act by a margin of 244-188, without a single Republican vote (reactions). Conservative radio talk show host Rush Limbaugh termed it the "porkulus" bill. On February 10 the Senate approved its version of stimulus legislation by a vote of 61-37; three Republican Senators voted for the measure (Susan Collins and Olympia Snowe of Maine and Arlen Specter of Pennsylvania). After conference committee, Congress approved a $787 billion package on February 13; the House vote was 246-183 and the Senate vote 60-38 (reactions). Obama signed the legislation into law on February 17. (remarks; H.R. 1) According to the administration $288 billion will go for tax relief, $144 billion for state and local fiscal relief, $111 billion for infrastructure and science, $81 billion for protecting the vulnerable, $59 billion for health care, $53 billion for education and training, $43 billion for energy, and $8 billion for other purposes; this will "create or save 3.5 million jobs." The Administration emphasized spending the money quickly and wisely while avoiding waste and fraud. Vice President Joe Biden chairs regular implementation meetings, a Recovery Act Transparency and Accountability Board was established, and the recovery.gov website further added transparency. Given the global economic crisis, the economy was front and center from day one. At the outset of the administration Obama added an "Economic Daily Briefing" to his schedule during which he and top aides go over the latest economic news. On February 6 he signed an executive order establishing an Economic Recovery Advisory Board. On February 25 the CIA began to produce a daily classified "Economic Intelligence Brief" reviewing international economic developments for top officials. The White House Task Force on Middle Class Families, headed by Biden, held its first meeting on February 27. On February 10 Secretary Geithner announced the financial stability plan. The initial announcement did not go over too well, but over the next several months elements of the plan were rolled out including the Homeowner Affordability and Stability Plan (February 18) to address the home mortgage crisis (the administration estimated the plan would help between seven and nine million homeowners); the Consumer and Business Lending Initiative (March 3) to revive credit markets; and the Public-Private Investment Program (March 23) to help financial institutions clear up troubled assets. [see financialstability.gov] On February 20 the Presidential Task Force on the Auto Industry convened to take up the restructuring of General Motors and Chrysler, the two companies which had received emergency loans under the Bush administration. On March 30, Obama announced that neither company had submitted a sufficient restructuring plan. He gave GM 60 more days to improve upon its plan and Chrysler 30 days to work out an agreement with Fiat or face bankruptcy. Obama also announced the resignation GM chairman and CEO Rick Wagoner "as an initial step." In addition to steps to address the immediate problems, the administration also started work on regulatory reform. A noticeable hiccup in all these efforts occurred in mid-March when news over bonuses to AIG executives generated considerable outrage. Meanwhile, the budget process unfolded. As a prologue, on February 23 Obama held a summit on fiscal responsibility where he pledged to cut the deficit in half by the end of his first term. On February 24 Obama presented the big picture in his address to a joint session of Congress, declaring that the "day of reckoning has arrived, and the time to take charge of our future is here." In the speech Obama reviewed the stimulus package and steps to counter the credit crisis and then focused on energy, health care, and education. On February 26 he released an outline or blueprint of his first budget (remarks, reactions). "A New Era of Responsibility" outlined the specific investments in energy, health care and education that the Administration proposed. Obama declared that, "While we must add to our deficits in the short term to provide immediate relief to families and get our economy moving, it is only by restoring fiscal discipline over the long run that we can produce sustained growth and shared prosperity." All told the plan called for outlays of $3.55 trillion in FY 2010 and a deficit of $1.17 trillion after spending of $3.94 trillion in FY 2009 and a deficit of $1.75 trillion. In a statement, House Republican Leader John Boehner said, "This budget taxes, spends, and borrows its way toward a bigger, more costly federal government at the expense of small businesses, family farms, middle-class families, retirees, every American who owns a 401(k), and anyone who flips on a light switch.” Senate Republican Leader Mitch McConnell stated, "I have serious concerns with this budget, which demands hardworking American families and job creators turn over more of their hard-earned money to the government to pay for unprecedented spending increases." "Last year's business," the $410 billion FY 2009 Omnibus Appropriations Act, created an awkward situation for Obama. The legislation, which should have been finished in 2008 to keep the government running through the end of the fiscal year, was replete with thousands of earmarks. The House passed the omnibus on February 25, the Senate on March 10. Obama signed it on March 11, but he also outlined principles for earmark reform. "I am signing an imperfect omnibus bill because it's necessary for the ongoing functions of government, and we have a lot more work to do," he stated. "We can't have Congress bogged down at this critical juncture in our economic recovery." By April 10 Obama could say that there were "glimmers of hope" on the economy, but there were also many signs of continued difficulties from long lines for jobs and job fairs to the prospect of more rounds of foreclosures. On April 29 the Bureau of Economic Analysis reported that according to advance estimates real gross domestic product decreased at an annual rate of 6.1 percent in the first quarter of 2009, following a 6.3 percent contraction in the fourth quarter of 2008. On Capitol Hill, the House and Senate passed the FY 2010 budget resolution by party line votes -- 53-43 in the Senate (Democrats Bayh, Byrd and Ben Nelson, as well as Arlen Specter, voting against) and 233-193 in the House (reactions). Obama faced a number of challenges in his role as Commander-in-Chief. On February 17 he presented plans to send an additional 17,000 troops to Afghanistan. On February 27 he announced plans to draw down combat forces in Iraq by August 31, 2010; a residual force of 35,000-50,000 troops will remain, to be phased out, as required, by the end of 2001. These decisions did not sit well with peace activists (press release). In addition to his short visit to Canada, Obama made two overseas tours. On March 31 he embarked on a trip that took him to the United Kingdom for the G-20 meeting in London, to France and Germany for the NATO summit, and to the Czech Republic, Turkey, and an unannounced stop in Iraq. Following the G-20 summit Obama stated that "after weeks of preparation, and two days of careful negotiation, we have agreed on a series of unprecedented steps to restore growth and prevent a crisis like this from happening again." Particularly noteworthy was a significant boost in funding for the IMF. In mid-April Obama visited Mexico and then attended the Summit of the Americas in Trinidad and Tobago. Although Obama did not face a major foreign policy crisis in the first 100 days, tense moments came with North Korea's April 5 launch of a Taepo-Dong-2 missile and the taking of an American captain as a hostage by Somali pirates on April 8. The swine flu outbreak was grabbing headlines, and there were concerns it could reach pandemic proportions. On the question of holding the Bush administration accountable for reported abuses, Obama ran into a bit of a sticky mess. A number of liberal groups (example) and some on Capitol Hill wanted "truth commission." As Sen. Patrick Leahy (D-VT) stated on CBS' "Face the Nation" on April 26, "I know some people say, let's turn the page. Frankly, I'd like to read the page before we turn it." Debate on this subject heated up on April 16 when the Department of Justice Office of Legal Counsel, involved in a FOIA request with the ACLU, released four Bush-era legal opinions on interrogation techniques. A week later the administration said it would also release photos of detainee abuse. While emphasizing he wanted to move forwards and not backwards on these issues, Obama sent mixed messages. In addition to the hard work of governing, there were lighter moments. On March 20 Michelle Obama joined with students from Bancroft Elementary to start the White House Kitchen Garden in a section of the South Lawn. In April, Bo, a six-month old black and white Portuguese water dog, made his debut at the White House in front of a media circus (press releases). Although the Democrats' spending plans provided large targets for conservatives and Republicans to rally against (see CPAC 2009), this reinforced Democrats' portrayal Republicans as "the party of No." Republicans seemed to be casting about for ideas and leaders. They had McConnell and Boehner in Congress, while over at the RNC chairman Michael Steele experienced a rocky beginning. The loudest voices on the conservative side came from Rush Limbaugh and other talk radio hosts who fulminated daily against Obama and congressional Democrats. Limbaugh in particular emerged as a lightening rod with his declaration, "I hope he fails." Republicans pointed to ongoing media bias that worked against them. For example, an analysis (1) by the Center for Media and Public Affairs of ABC, CBS and NBC evening newscasts during the first 50 days found that, "Mr. Obama has received not only more press but also better press than his immediate predecessors." The numbers were fairly staggering: a total of 27 hours and 44 minutes of airtime on the Obama administration compared to 7 hours and 42 minutes on the Bush administration and 15 hours and 2 minutes on the Clinton administration in their first 50 days. Further 58 percent of evaluations of Obama by sources and reporters were positive compared to 33 percent for Bush. A study (2) by the Pew Research Center's Project for Excellence in Journalism of news coverage in the first 60 days of the adminstration likewise found that, "President Barack Obama has enjoyed substantially more positive media coverage than either Bill Clinton or George Bush during their first months in the White House." The GOP suffered several setbacks during this period. In the March 31 special election to fill the 20th CD seat in eastern New York that had been held by Kirsten Gillibrand, venture capitalist Scott Murphy (D) defeated Assemblyman Jim Tedisco (R); the vote was close enough that it took until April 24 for Tedisco to concede. A sharper blow fell on April 28, when Sen. Arlen Specter (PA), looking towards his 2010 re-election campaign, announced his switch to the Democratic party (statement, reactions). Although the Minnesota Senate race remains unsettled following Norm Coleman's appeal of the court decision that gave Al Franken a 312-vote win, Specter's move appeared to put Democrats on the path to a filibuster-proof 60-seat majority in the Senate. "And so the typical President I think has two or three big problems; we've got seven or eight big problems. And so we've had to move very quickly, and I'm very proud of my team for the fact that we've been able to keep our commitments to the American people to bring about change while, at the same time, managing a whole host of issues that had come up that weren't necessarily envisioned a year and a half ago." -President Obama in his April 29 press conference. In a period of one hundred days, President Obama and congressional Democrats passed a $787 billion stimulus package and a $3.55 trillion budget resolution. The question is whether these bold measures represent sound investments for the future or steps towards big government socialism and mountains of debt for future generations. Obama marked the 100th day of his administration with a town hall meeting in Arnold, MO, 20 miles south of St. Louis, and the third prime-time press conference of his presidency. He declared himself "pleased with the progress we've made, but...not satisfied." "We've come a long way, we can see the light on the horizon, but we've got a much longer journey ahead," he stated.